I started to think about writing this blog last month when I noticed that Daisy had begun to use the possessive pronoun “my”. We heard her label everything as “My” – My Daddy, My Mummy, My teddy, My books. She then began clutching an armful of toys or cuddlies, declaring “Mine”; she even referred to herself as ‘my’ as in ‘my do it’. Daisy has now reached the stage of development where she is ready to learn that some things are hers, some things are shared, and some things belong to others. Of course without siblings, all the toys in the house are hers, but when Daisy has a playdate at her home or our house she will needs understand that some toys are for sharing. Daisy also needs to understand that we all have things that we can call “mine” but that we can share them with others and those things will come back to us. So we try to reassure Daisy that when she plays with other children, and they play with some of her toys, they will leave her toys with her when they go home. For a recent playdate we put out Duplo bricks and animals, plenty of train track, two trains and two sets of carriages. This allowed the two 2-year olds to play in proximity and occasionally play ‘together’ while we sat close by on the floor and joined in with the play. Before the visit we had put Daisy’s really favourite toys away in her bedroom and explained that her friend was coming to play with her toys but when he left, her toys would stay. This is something that’s easy to do for any young visitor that you have to reassure them that you understand that these toys are special to them. The intention is to help Daisy understand about belongings and ownership without any great conflict and frustration for her. But it’s not a straightforward stage because the concept of sharing is very hard to understand when you are only two. Sometimes we share things that are returned later, but we also might ask Daisy to share her raisins and those raisins aren’t returned later! One of the best ways for Daisy to have an understanding of sharing is see how we ‘share and take turns’. The other opportunity to experience taking turns and the process of sharing can come at playgroup where the toys are available for all. Children have to wait for their turn when the drink and snack is being handed out, they have to wait to take a turn on the slide or swing and they may have to wait to have a turn to play with a particular toy. This waiting is the hard part to cope with. We make sure we are close by to we help Daisy know that she can ask for a turn and also say ‘not finished’ if another child grows impatient about their turn. Taking turns and the process of sharing is something we can demonstrate in our routines and in play with children. 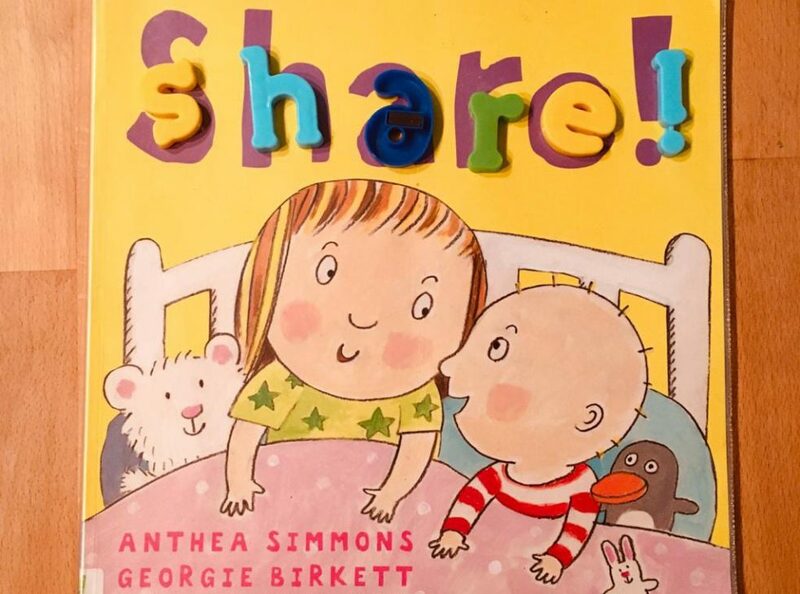 Include sharing language during activities and talk about taking turns such as stirring the cake mixture and putting a spoonful into the cake cases; sharing my glue stick with Daddy; Mummy sharing her hair straighteners with Granny. When shopping for groceries talk about buying food that we will share with Mummy & Daddy. Show how we share something that won’t be returned to us – a bag of crisps or some of the cakes we’ve just baked (with generosity and a thank you).